A nature study of the Esperance region of Western Australia. 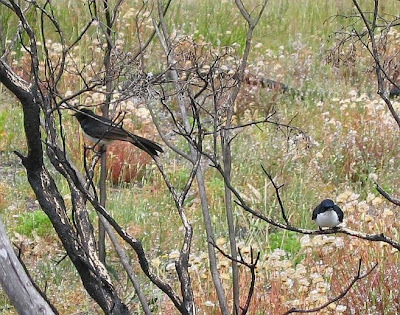 Willie Wagtails are at the top end of the birdie property market. Have you ever gone past a house and thought, wish I owned that! Well you may not realise it, but the same thing enters the mind of our feathered friends. A pair of Wagtails began to nest under a large (5 metre high) Banksia speciosa (the Showy Banksia), inside it is shady, but quite open except for some well spaced, twisted and spreading leafless branches. They chose a spot on a sturdy horizontal branch more than a metre from the ground, then began work on the nest. From a distance the wagtail's nest looks like a mudlark's nest, ie a heavy duty swat mug sitting on top of a branch, except instead of being made from mud, is made from entwined grass and lined inside and out, with cobwebs. Nest under construction. The cobweb lining has yet to be added. Now at this stage, it began to catch the eye of other local nesting birds, the Yellow-winged Honeyeaters and Little Wattlebirds. They would stop-by during the day to watch the construction technique and admire the final cobweb touches. Often they had to be chased away; such was their curiosity. Now when mum began her vigil on the nest and laid four eggs, the interest grew stronger, everyone wanted a peep and there would always be a honeyeater just waiting for a quick glimpse at changeover time. However, when the kids arrived, one wagtail parent was required to be on duty at all times to stop the enraptured onlookers from more detailed inspection. But then came the day when the kids could fly and the Wagtail family moved away leaving behind an empty, yet still functional nest. An unoccupied nest of such quality was not left vacant for long, particularly from the yellow-winged honeyeaters, some of whom hopped in and wiggled their chests and bottoms, to shape it to their size. One in particular would make many little adjustments by pulling up an edge and then shimmying around to mould it perfectly to her shape. She was captivated, it was just so cosy and fabulous, she loved the plush cobweb interior and would constantly peer over the edge to the outside, noting the functional design and craftsmanship that had gone into its construction. Unfortunately a few days later we had several inches of rain, which left the nest in a very bedraggled state. However the honeyeater could still see the potential and continued to visit. She would settle in the cup, get comfortable and then try to pull the edges back into place. She tried for several days, but eventually gave up as it became apparent that it was beyond repair and her dream home was no more. Mum and Dad Willie Wagtail have not been back to the nest, but the other night one of the now fully grown kids was roosting on the branch within pecking distance, showing even the kids had fond memories of the cosy little home they grew up in. So next time you see a couple like these, they could be increasing the market value of your property if only for a while, and probably from those with few assets. But hey, there is more to life than money! What a delightful story about a charming backyard bird! I also have a visiting Willie Wagtail family. They can be a tad bossy at times, but definitely charming. I reckon the Willie Wagtail must be one of the most widespread of our feathered friends. During my travels there has usually been one there. What a delightfully told story!! Anthropomorphising at its exquisite best!!!!!! And the gigantic patience you must have! When I do my beachwalk (south of Sydney) a little willie wagtail often seems "to come with me". (I would walk for a few kilometres and he would stay with me). It's the only bird I personally have observed who seems to travel alone and not have a parter with him or just around the corner. I also heard that they have quite a high degree of importance in the indigenous culture - I seem to remember that they are the "messengers" of something...but dont remember what. I am here more often than I post - and it's always a joy. Hi MissAnthropy, thanks for the encouragement. I think most living things have personality and try to make sense of their world. Science has proved that the more we investigate other species the more we realise how much we have underestimated them. An ardent nature lover who is happiest when in the bush. The object of this blog is to record the nature around me, particularly the unusual or rarely encountered flora and fauna. My photography is governed by my equipment that being a modest Canon A80 PowerShot Camera with standard lens. So I do not set out to portray subjects in high photographic detail, but to show them in an interesting pose and to highlight species characteristics.